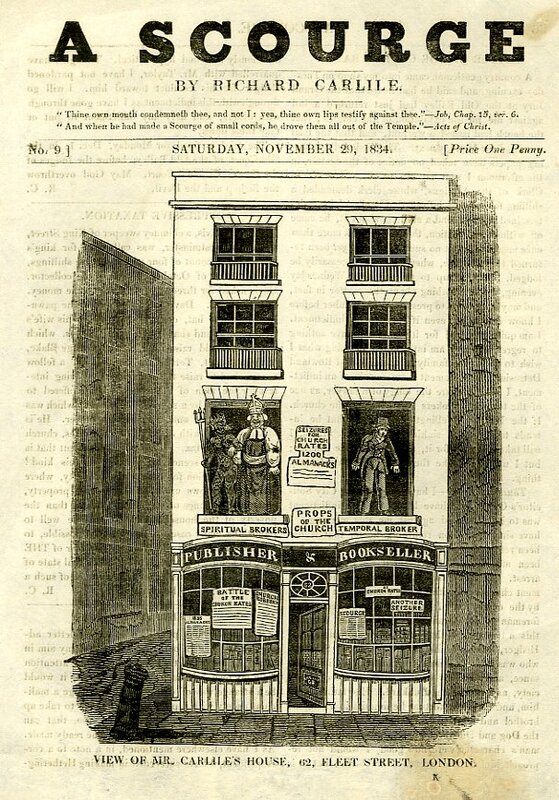 The frontispiece to the Scourge of Saturday 29th November 1834 featured a woodcut engraving showing the front of Carlile’s shop at 62 Fleet Street with the controversial caricature displays mounted in the upper windows. Knight’s in Sweeting’s Ally; Fairburn’s in a court off Ludgate Hill; Hone’s in Fleet Street – bright, enchanted palaces … How we used… to stray miles out of the way on holidays in order to ponder for an hour before that delightful window… There used to be a crowd round the window in those days of grinning, good-natured mechanics, who spelt the songs and spoke them out for the benefit of the company, and who received the points of humour with a general sympathizing roar. However there were many residents of London who took a far less rosy view of the crowds which habitually gathered on the pavement outside print shops. The playwright Oliver Goldsmith complained that such gatherings were little more than a collection of “quacks, pimps, and buffoons”, in which “noted stallions only made room for more noted strumpets”. References to printshops which appear in the records of the Old Bailey support Goldsmith’s assessment, indicating that thieves and pickpockets frequently prayed on those who lingered for too long in front of the printshop windows. 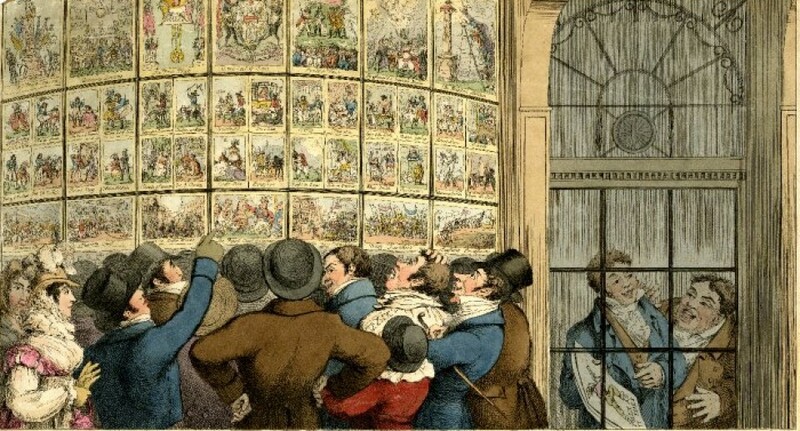 This association with petty crime and the working classes prompted those of a conservative disposition to go a step further, condemning the printsellers windows as breeding grounds for sedition and revolt. The prospect of a crowd of Thackery’s ‘grinning mechanics’ gathering to laugh and sneer at the failings of their rulers and social betters filled many Tories with a sense of indignation and dread. It is attitudes such as these which explain why the authorities took the extraordinary step of arresting the print and bookseller Richard Carlile in the autumn of 1834. Carlile was a well-known radical, a friend and associate of Henry Hunt and a man who had already served several jail terms on charges relating to the publication of seditious, blasphemous and libelous material. In October 1834 his shop in the Fleet Street was raided by police after the publisher refused to pay tithes to the Anglican church on the grounds that he was an atheist. Carlile retaliated by having two life-sized anti-clerical caricatures mounted in the first floor window of the shop. The first depicted a stereotypical image of a greedy pawnbroker and was labelled Temporal Broker, whilst the second consisted of a bishop cavorting arm-in-arm with Satan under the title Spiritual Broker. The title of, The Props of the Church was then painted across the front of the shop in large lettering. Buried under a sea of complaints from local shopkeepers and outraged members of the middle classes, the civic authorities felt compelled to act but were unsure of how to proceed against the radical publisher. Whilst action had been taken to clear crowds from outside print shops in the past – in 1828 the police and local magistrates had been called to clear a large mob from outside G.S. Tregear’s shop in Cheapside – this would not result in the removal of the offensive caricature from Carlile’s window. On the other hand, the authorities could not simply take action against the content of the caricature because it was notoriously difficult to bring a charge of seditious libel against someone for publishing an image. In April 1812 the British government had considered taking legal action against the publishers of The Scourge but had abandoned the idea when the Solicitor General advised that a caricature “would require so much of difficult explanation in stating it as a libel that it does not appear to us advisable to make it the subject of criminal prosecution”. A transcript of Carlile’s trial in November 1834 can be found at the Old Bailey Online.